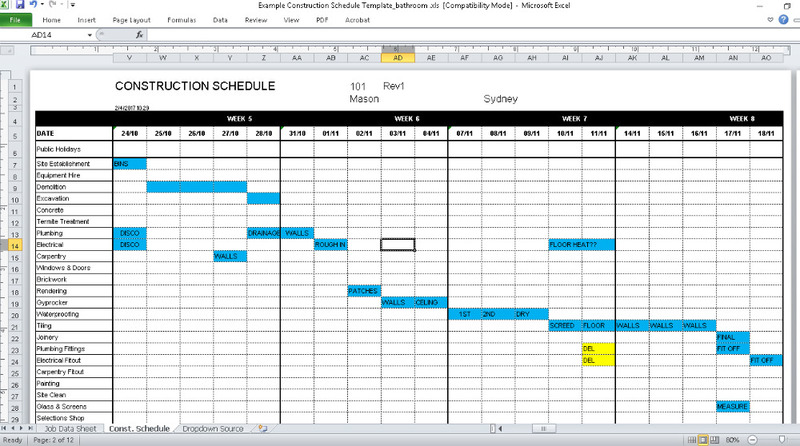 Using a construction schedule template to plan out your project timeline is a great way to save time. There’s no doubt about it, lining up all your key contractors and resources is one of the most important things you can do on a renovation project. It might seem daunting if you’re not a seasoned professional, but with a little guidance, you’ll be on top of things in no time. The construction schedule template will help you to get down the scheduling basics. Then you can adjust the details according to discussions with each one of your chosen building contractors. Another way to help project manage your renovation and plan out all the critical tasks one by one without clashes or overlap. Great for helping you think about each stage and what you’ll need to have organised when your tradies arrive on site. Great for helping you think about each stage and what you’ll need to have organised when your tradies arrive on site. 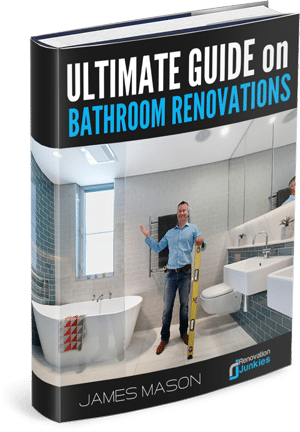 Will show you the order in which most bathroom renovations will be sequenced, and this is how I would suggest going through and finding your building contractors one by one as you work down your list. 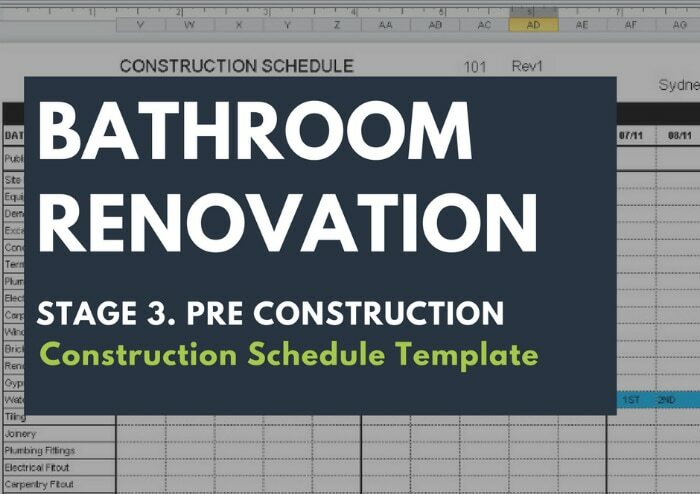 Below is an example of what a construction schedule template looks like (note: if you’ve enrolled in the How To Renovate A Bathroom course, all these templates are included). And here’s a video that demonstrates how to use one. Some of the considerations when filling out your schedule for each stage of the project are as follows. During site establishment, I also book in my plumber and electrician. This is to make the work area safe. It’s also to perform disconnections for things such as water, gas and power so that the area is ready for demolition. For all other items in your construction schedule template, I recommend discussing the timeframe to complete the works with the contractors. When you engage them in the process, that way you are working within timeframes that they advise they can complete them in. So there’s no unrealistic expectations from either party. One of the main considerations is trying to avoid a clash in your schedule where two or more contractors need to work in the bathroom at the same time. Bathrooms are generally confined spaces, and having guys working over the top of each other can be a recipe for disaster. Depending on the scale and size of your project, you could have a plumber come in the morning and electrician after lunch. But generally speaking, I like to book them on separate days to avoid any headaches. Another consideration is to keep your schedule current. If there are any changes such as delays or over runs with a particular section of your renovation, make sure you revise your schedule to reflect this. Once amended make sure you contact your preceding trades and advise them of any delay well in advance so they can reschedule to fit you in at a later date. Calling a contractor one or two days before they were due to start won’t cut it! Most good contractors will have a few months’ worth of work in front of them so it may take some shuffling on their part to fit you back in. Finally, when you’re happy with your construction schedule, give every contractor plenty of notice on their start dates. Then book it all in and get ready to watch the magic happen! That’s about it for now. I hope you can see the benefit of using this type of template to schedule in your construction work. 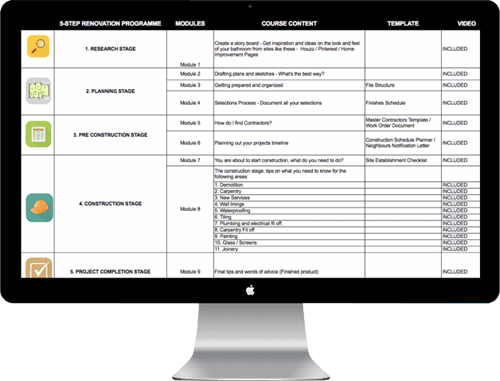 If you have been following along and completing all the steps and advice along the way you are now ready to jump into Stage 4: Construction Stage of your project! To recap, the 5 Stage Renovation Process will guide you through the exact steps I use as a professional builder when working on home improvement projects. If you have any questions let me know – I’m always happy to help! The super-simple, step-by-step process I use in my business to renovate bathrooms fast and on budget. 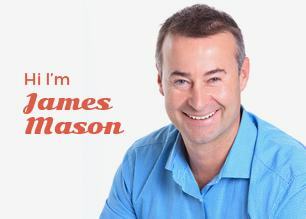 Hi Guys, Im a 40 something year old builder who loves to help people, if you have come to this site to find out tips and tricks on how to renovate you are in the right place! When im not adding content to this site im usually hanging out with my beautiful wife Alison and two daughters Alana and Eden. We have recently moved from the hustle and bustle of Sydney to the beautiful Sunshine Coast of Queensland. My two passions are my family and building, so that is probably why our homes are always under constant renovation! Renovation Junkies provides homeowners with essential DIY knowledge, trusted advice and tips on home improvement, giving you a place you can really fall in love with. Imagine the sense of achievement and pride you'll have in your handiwork everytime you show off that beautifully tiled bathroom, stylish Master Chef kitchen, or quirky attic extension. At Renovation Junkies, we believe that upgrading the look and feel of your home yourself can be a sense of occasion. But we also know that finding the budget to inject a fresh new look into your home can be a big challenge. Renovation Junkies was born out of the desire and passion to equip you with DIY knowledge so that you can enjoy a home you've always dreamed of without breaking the bank. And what better way to save money on your renovations than by managing the project yourself? Our in-depth online renovation courses will teach you everything you need to know – taught by a professional builder. At Renovation Junkies we're all about empowering you with the right set of skills so that you can take control of your own renovation. Find all the information you need to sharpen your DIY home improvement instincts and skills. From painting tips for a professional looking finish, to dealing with building contractors, to selecting the right finishes for your bathroom or kitchen renovation. Is your home in dire need of a facelift? Your kitchen desperate for a makeover? Or do you need to create more space as your family grows in size? But what can you do if you can't afford to hire a building company? For those with limited budgets to work with, the rewards of DIY home improvement are beyond measure. If you're looking to add a real personal touch and value to your home nothing comes close to doing it yourself. Renovation Junkies makes DIY home improvement possible. If you're a first-time homebuyer, serial renovator, have never renovated before or are renovating for investment, then our website is made for you!